If you’re having a bad day and everythings going crappy, grab a cookie, cake or pie and just be fat and happy. This cookbook, the third in a series of White Trash Cooking, (is the world ready for three?!) follows closely the style and rhythm of the previous two books. White Trash Cooking I and II were written by Ernest Matthew Mickler. 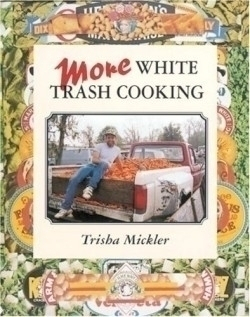 His cousin, Trisha Mickler, penned More White Trash Cooking keeping white and trashy food alive and well. It’s been said that a jovial, contented cook is a better cook. If that’s the case, any cook with this book will produce some fine meals, despite the sometimes-awful ingredients and scanty directions. The entertainment Trisha conjures up with More White Trash Cooking sets your funny bone a-wrigglin? and helps cooking to flow. The titles alone are a stitch: Elmo’s hush-up puppies, Lucy Belle’s funky chicken casserole, Irleen’s rump dump cake (“If ya don’t have a rump before eatin? this cake, you’ll have one after!”), and flew the coop chicken soup. Readers beware of laughing to hard to cook. White Trash Cooking likes to whack you back and forth between food and fun. Witness the recipe for fried cooter (freshwater turtles): “When the cooter sticks his head out, cut it off with a hatchet. Then open him up down the sides of his shell.” In the next breath Trisha’s giving us the serious and beloved recipe for her Daddy’s datil pepper relish. Although some of the recipes border on nouvelle White Trash with the use of teriyaki sauce (in Wild Bill’s deer burgers and fresh strawberries in Maisy Rae’s Plant City strawberry butter), this is not a book for yuppies. They will curl their collective lips up in despair. They will worry about their waistlines expanding from the liberal use of Oleo and butter, and about their taste buds from the frequent use of canned and boxed foods. This is a book for Middle America. More White Trash Cooking is a cookbook your old auntie from Ohio would love—assuming the title makes her laugh and not recoil. Most of Middle America actually buys and eats Lipton Onion Soup Mix, Veg All, mini marshmallows and Oleo, despite what the East and West Coast generated media and cooking shows might tell us. The older editions of The Joy of Cooking actually accomplish this food better with serious well-written recipes—but without the fun, personality and good natured jibes that are the true nature of so-called Southern White Trash. If you know a cook who needs some humor (and doesn’t mind American cheese, beef and potatoes), this book will do the trick.